F.P. 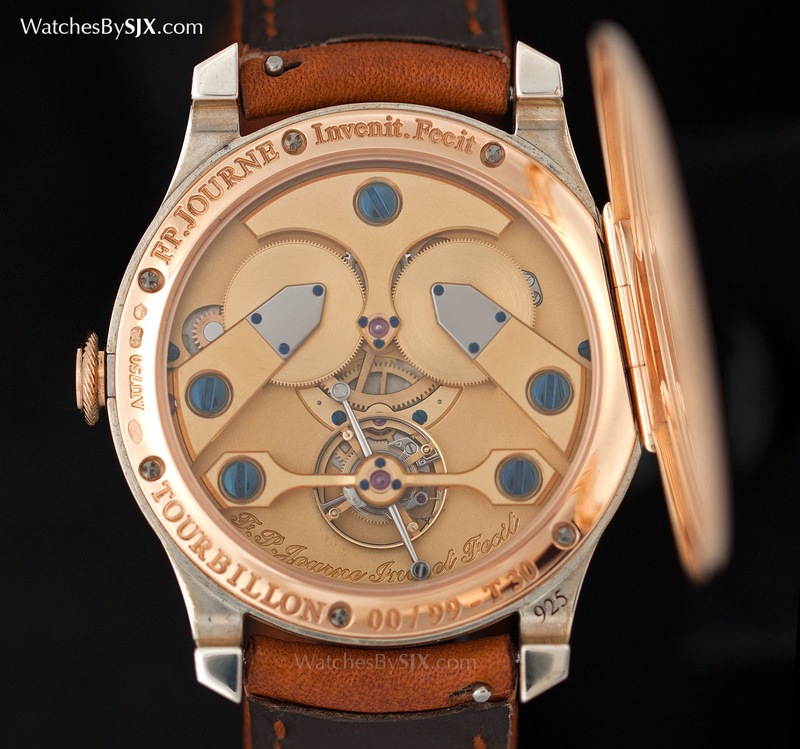 Journe retains the first – numbered “00” or “000” – of every model produced, both limited and regular production, for its own archives. 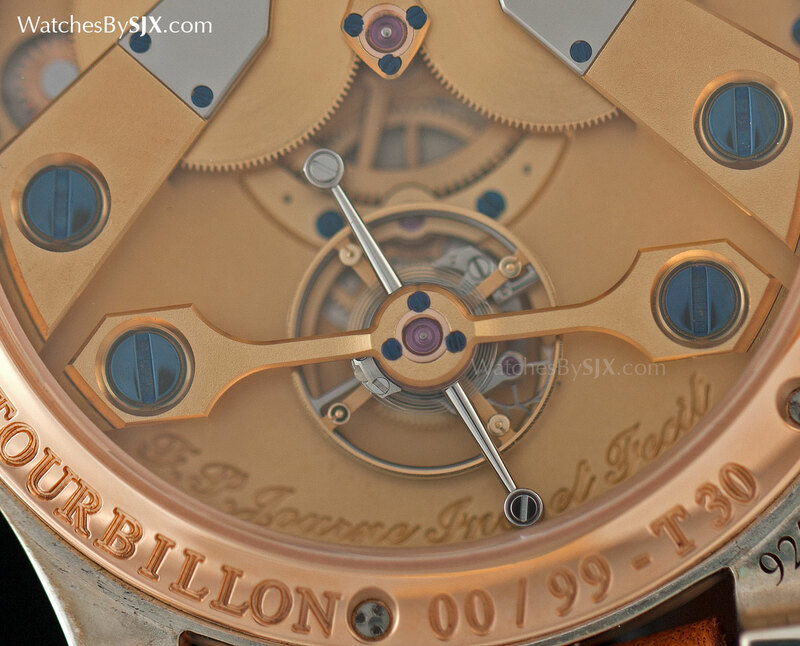 This Historical Anniversary Tourbillon “T30” is one of those timepieces, bearing the serial number “00”. Made to commemorate the 30 years since François-Paul Journe completed his first timepiece, a tourbillon pocket watch, the Historical Anniversary Tourbillon “T30” is essentially that pocket watch remade for the wrist. 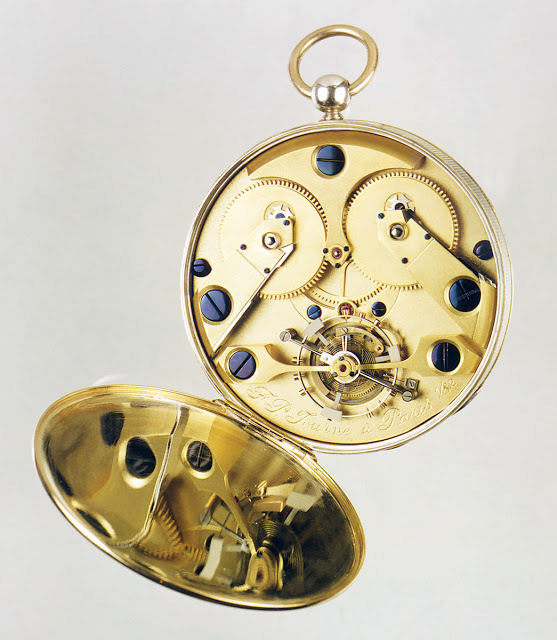 Every detail of the T30 wristwatch mimics the original pocket watch. Unusually for a modern wristwatch, the case is sterling silver, with an engined turned guilloche on the hunter back and sides. 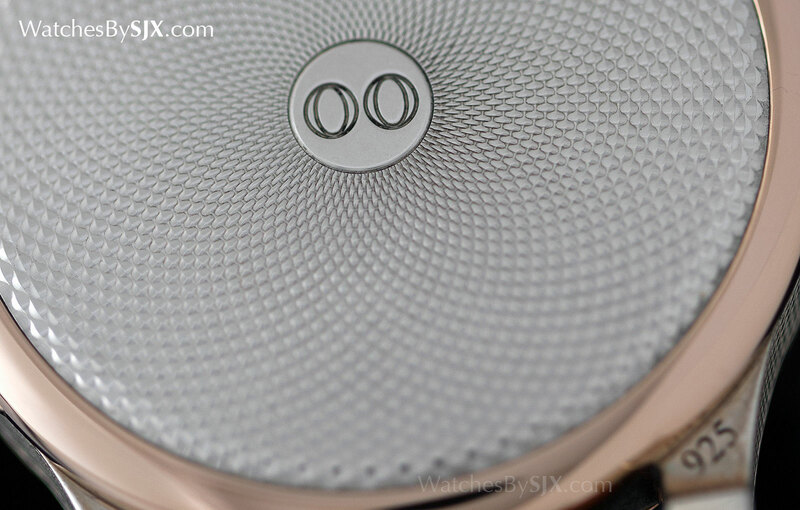 Rose gold is used for the bezel, case back and crown, just like in the pocket watch, but also a practical decision since gold is harder than silver. Silver is rare in wristwatches not only because of its softness but also because it tarnishes. The sterling silver (925 silver) case is not plated or varnished, so it quickly tarnishes with handling and exposure to the atmosphere, something that is obvious with T30 number 00. 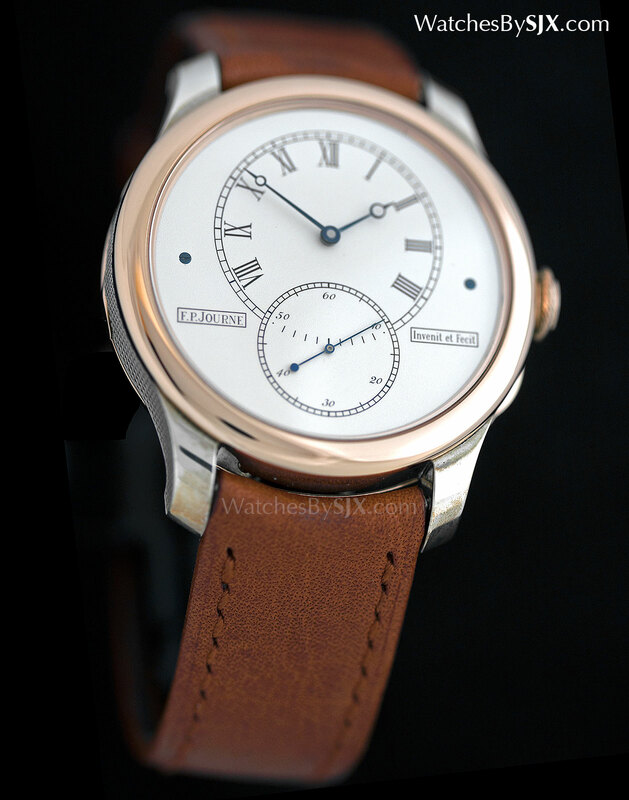 Like all Journe watches the T30 is slim, just 10 mm high, and 40 mm in diameter. 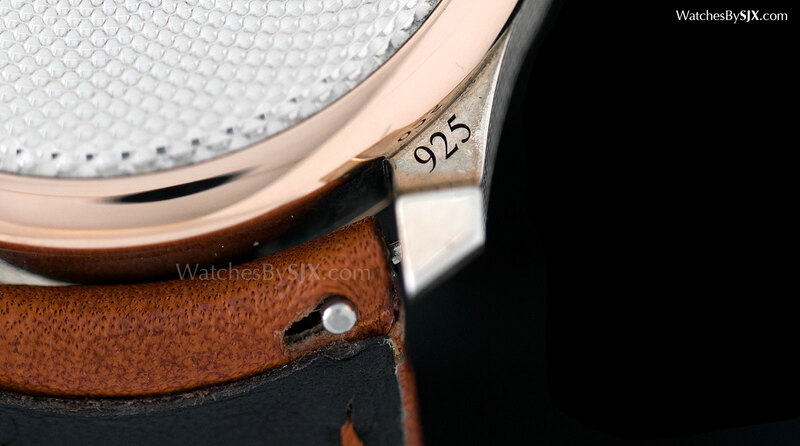 Its proportions are elegant, with the hunter case back adding almost nothing to the thickness of the watch. A classical face The dial has a fine, grained surface, with all the markings and indices engraved, then filled with black lacquer. 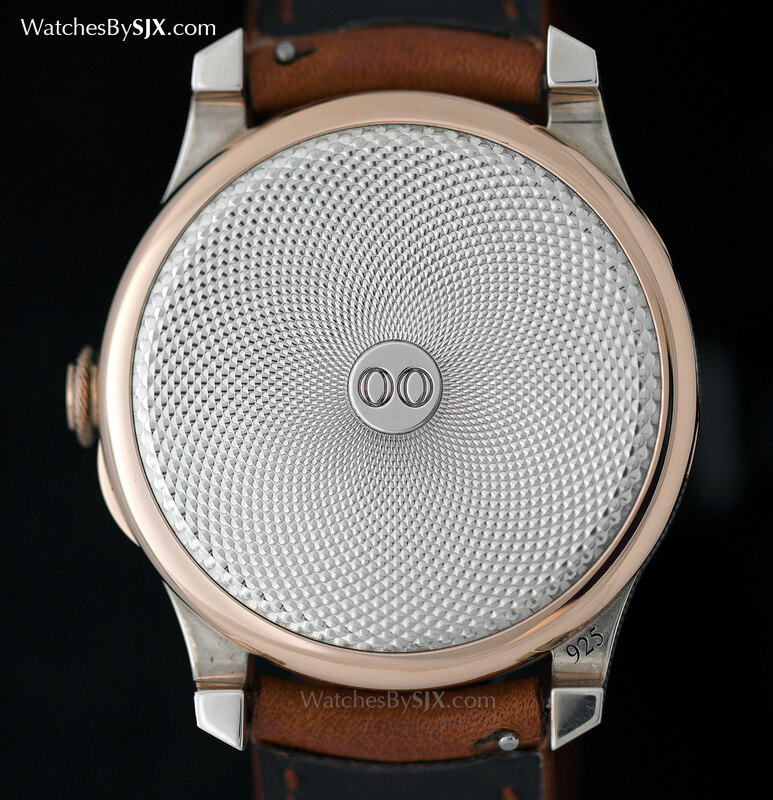 Because of the antiquated technique of engraving then filling, the result is a dial that looks like it was made decades ago – exactly the intention of the watch. 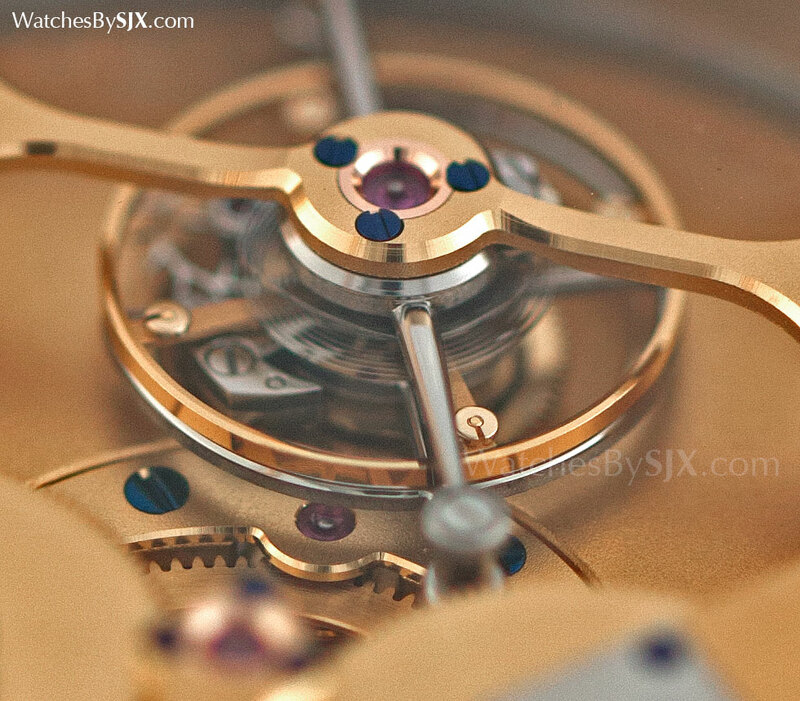 Visually the movement looks like that of the pocket watch, though there is a major technical difference: the pocket watch uses a spring detent escapement while the T30 has a conventional Swiss lever escape. 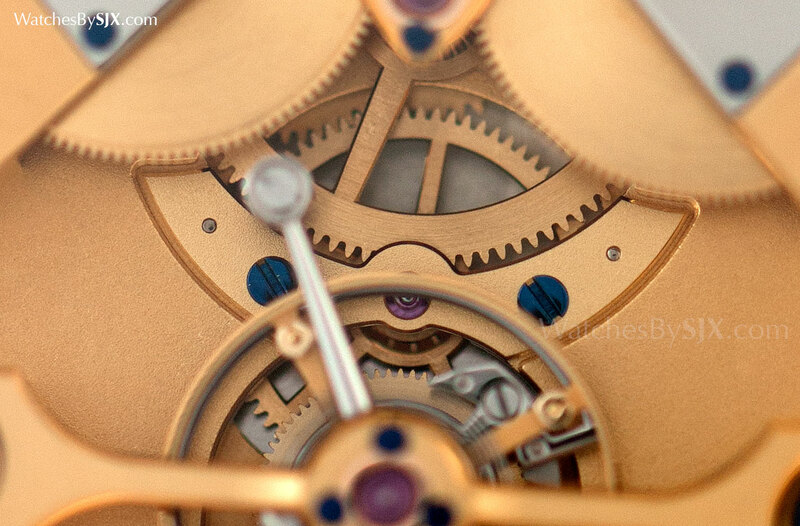 A necessary and forgivable concession to modernity and robustness; traditional detent escapements are not shock proof. What is most notable about the movement is the finishing. To start with the decoration is looks more elaborate than the typical F.P. 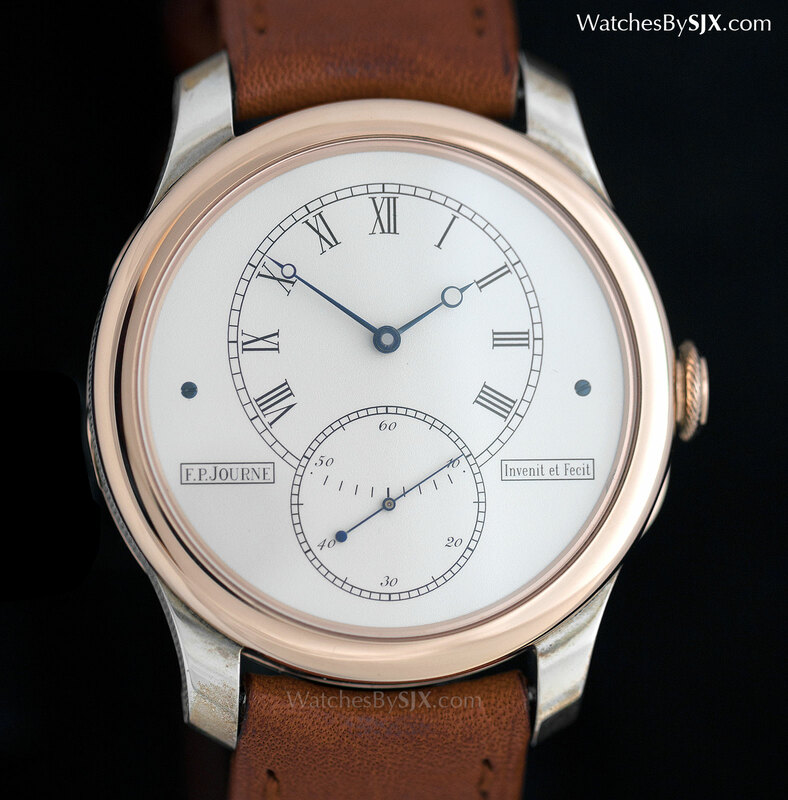 Journe wristwatch. But up close modernity is obvious in the finishing, particularly in the precise and sharp bevels of the bridges, meaning they were cut by machine. 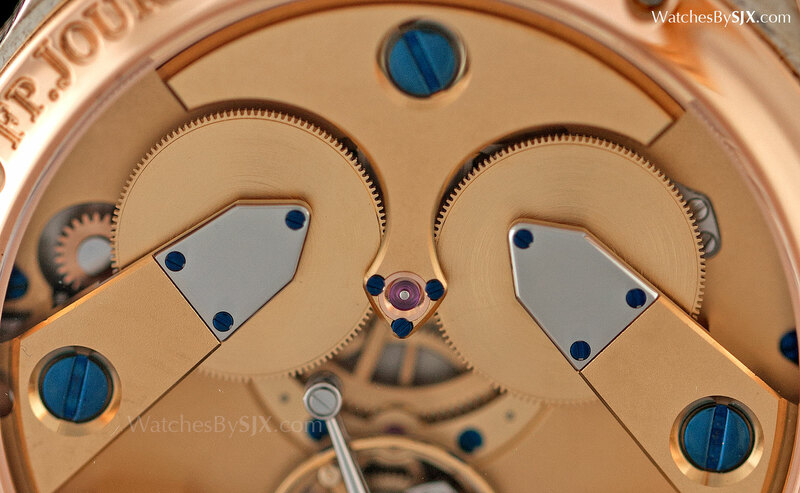 At high magnification the machining marks are faintly visible on the surfaces, most obviously on the tourbillon bridge. 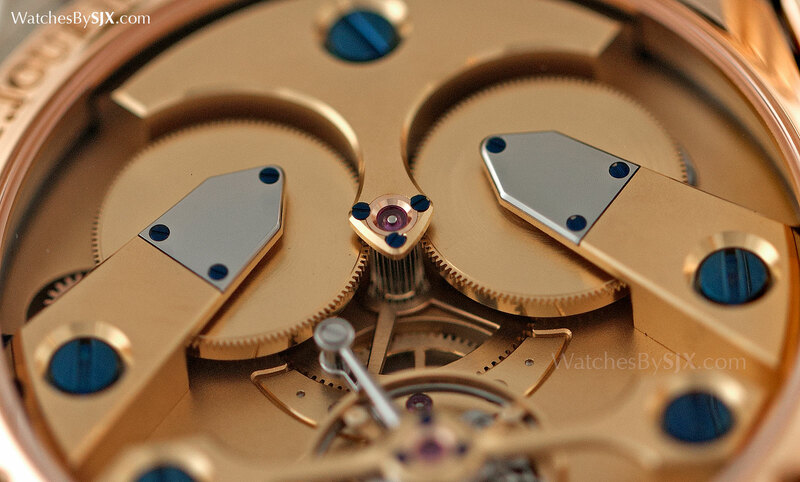 That is not a criticism of the movement – such techniques are widespread in modern high horology, even in more expensive watches. 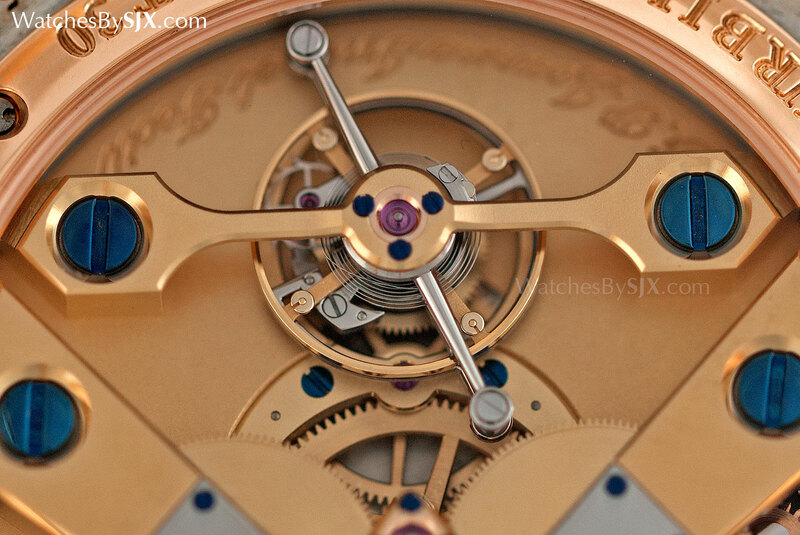 Hand-finishing is still employed in some components, most obviously in the rounded and polished steel arms of the tourbillon carriage. 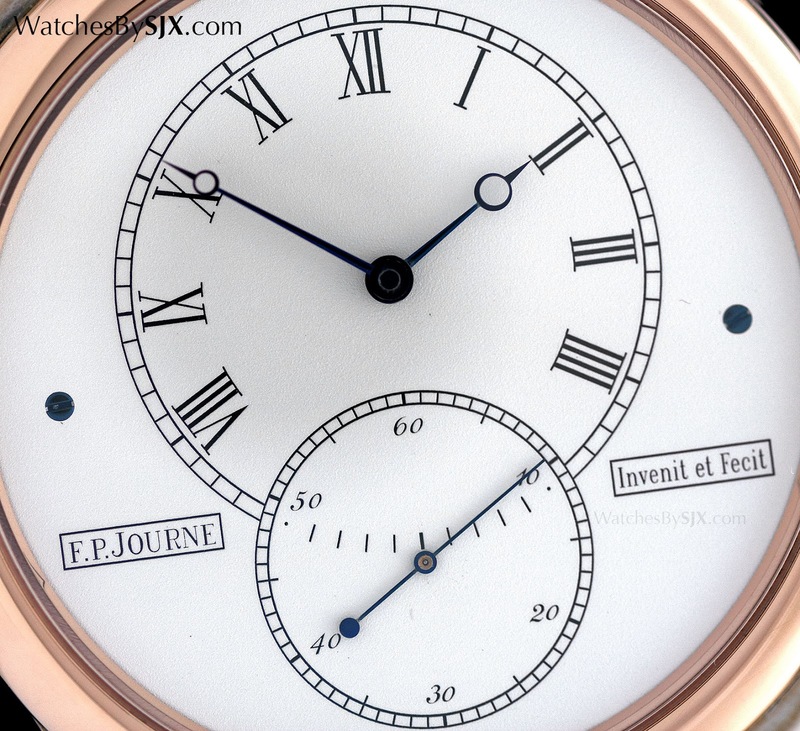 The decoration employed on this watch, appropriately enough since it’s a remake of Journe’s first timepiece, exemplifies the brand’s approach. F.P. 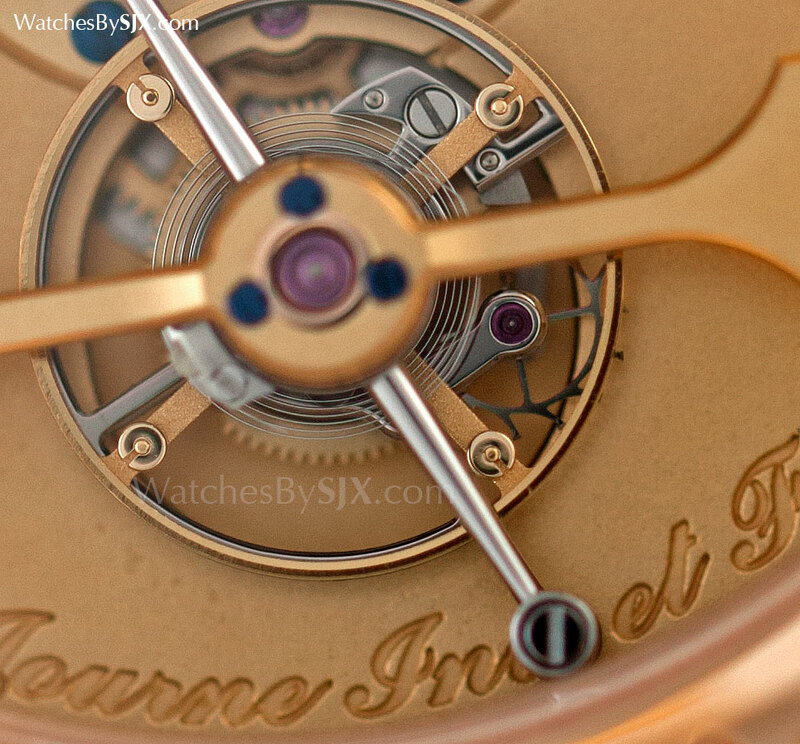 Journe has never been about exemplary finishing in the vein of Philippe Dufour, instead his brand of watchmaking comprises ingenious movements – with much inspiration from the works of Janvier, Leroy, Breguet et al – with solid, good-enough decoration. 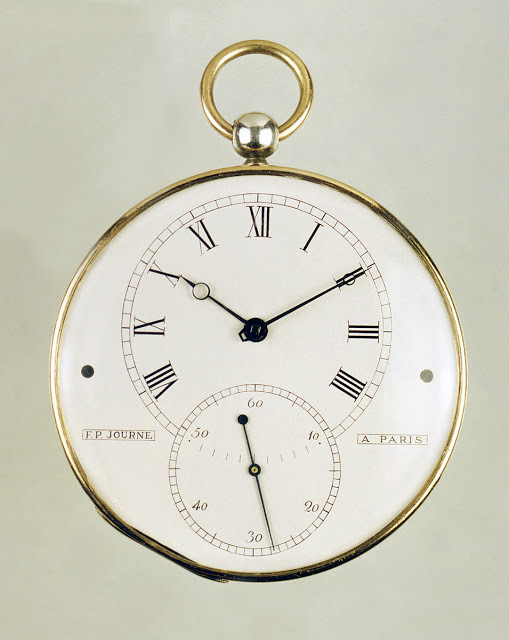 The final result, here and in his other timepieces, is that the whole is greater than the sum of the parts.